Considered to be a modern day classic in the field of anime, Akira was first released back in 1998 and featured Neo Tokyo in the year 2019 after World War III has decimated Tokyo. Motorcycle gangs have arisen in a desperate bid to take control of the city's underworld. During a battle on the street, a chance encounter with an escapee from a Army Barracks changes the way the friends will look upon society forever. The Army is conducting experiments and captures Tetsuo to conduct experiments on him under the assumption that no one will miss him. This is far from true however and his best friend Kaneda tries to help Tetsuo and find out what has been done to him. When Tetsuo's latent psychic abilities are unleased, Testuo loses control of both his powers and mind. Akira was a classic movie, shot on film to preserve the integrity of the original artwork and I believe would have to be one of the last big budget anime to be produced in the traditional manner on drawn and painted cels. When it first came to DVD it was on 2 discs, however Madman have made the sensible step of picking the cream of the crop and putting it onto one disc. Asides from the brilliant storyline and art, Akira also is unique as it portrayed anime for the first time as truly grim and realistic, betraying the status quo of big eyes and cute girls. Everyone is drawn very realistically and the voice acting on this version is exceptional as is the syncing voices to the animation. This was included in this particular version as the first time it was released the voice acting was horrendous. If you really want you can select that audio track from the menu, but why would you want to? I found the audio to be wonderful and this new edition does not contain any white noise that I am aware of, it is all very crisp and defined. The video transfer is also very good, however it did occasional aliase when playing, though that is being picky and I didn't realise notice it too much. The extras are extremely nice and give you a good cross view look at promotional trailers from both America and Japan. The menu system is easy to operate and is not convoluted like some DVDs out there. I highly recommend Akira and guarantee it will impress even the most jaded viewer. It's truly a masterpiece and an integral part of the history of anime. 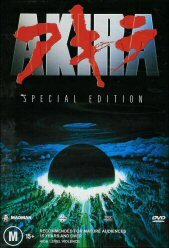 Get Akira today!